No matter how much you -- and your kids -- like candy, chances are you'll have a stash remaining after the Halloween rush is over. Instead of throwing it out, consider incorporating it into some of these tasty and unique sweet treats. For optimal results in these recipes, do not use candy that has passed its expiration date. 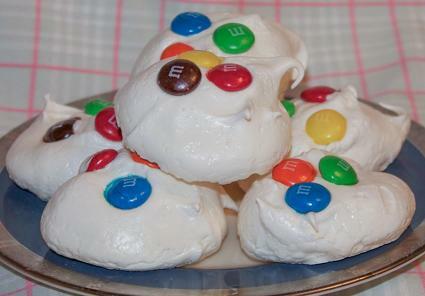 Candy meringues are a great choice for those looking to satisfy a sweet tooth. The final recipe produces 12 meringues, or 12 servings. Pre-heat oven to 200 degrees Fahrenheit. Place egg whites in a large mixing bowl, and beat with an electric mixer for one minute, or until frothy. Gradually add sugar, and continue to beat for five to eight minutes, or until stiff, glossy peaks form. Place tablespoon-sized dollops of the mixture onto the parchment-lined baking sheets. Top each dollop with three M&M'S or Skittles. Bake for 1 1/2 to 2 hours, or until meringues are dry to the touch. Be aware that M&M'S may melt a bit during the extended baking process. If you live in a high altitude area (3,000 feet or higher), add a third egg white to the ingredients and beat for approximately three to five minutes longer to reach the right consistency. Instead of reaching for the ice cream, consider making frozen banana pops with Halloween candy that have a yield of six servings. Place a popsicle stick into the bottom of each banana half. Freeze bananas for two hours, or until very firm. 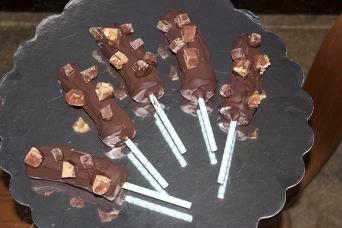 Freeze chocolate candy bar pieces for two hours, or until very firm. Heat chocolate chips in the microwave at medium heat for one minute, stirring after 30 seconds and 60 seconds. If chips are not completely melted after this time, continue to heat in microwave, stirring after every 15 seconds. Dip the frozen bananas into the melted chocolate mixture, and coat well. Place the chocolate-covered bananas on the parchment-lined baking sheet. Sprinkle the chopped chocolate candies over the chocolate-covered bananas. Freeze the bananas for 10 to 15 minutes, or until firm. Chewy candy trail mix is a healthier option that provides a sweet and savory crunch and provides a yield of six servings. Use a pair of kitchen shears to cut larger pieces of candy into one-inch pieces if needed. 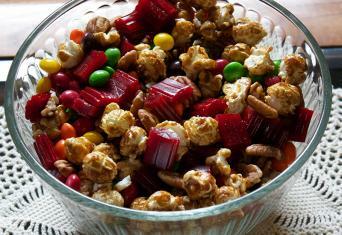 Toss candy with caramel corn and pecan halves. No matter your candy of choice, these cookies are a great way to get rid of leftovers. Total recipe produces a yield of four dozen cookies. With an electric mixer, beat butter, cream cheese, vanilla, egg yolk, and sugar in a large mixing bowl for three to five minutes, or until light and fluffy. Slowly combine flour and salt with creamed butter mixture. Place dough balls onto parchment-lined baking sheets. Press three to five chunks of candy into the tops of each cookie ball. Bake cookies for 10 to 12 minutes, or until lightly browned. 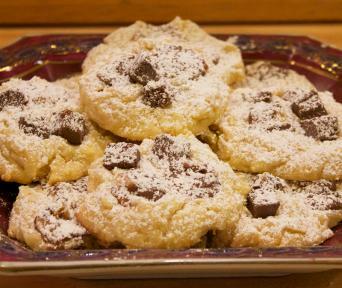 Dust cookies with powered sugar, if desired, once cooled. 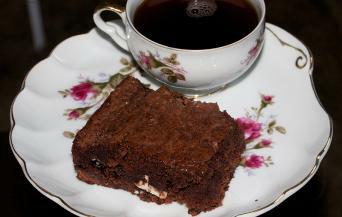 Shake up traditional brownies by adding peppermint patties. The recipe produces 16 servings. Grease an eight-inch square baking pan. Pour half of the brownie mix into the baking pan. Place the peppermint patties on top of the brownie mixture, leaving a half-inch border of brownie around the edge of the pan. Pour the remaining brownie mix over the top of the peppermint patties. Allow brownies to cool, then cut into 16 pieces. For a dessert that is sure to please kids of all ages, consider the use of leftover Halloween candy. Your family is guaranteed to keep coming back for more!